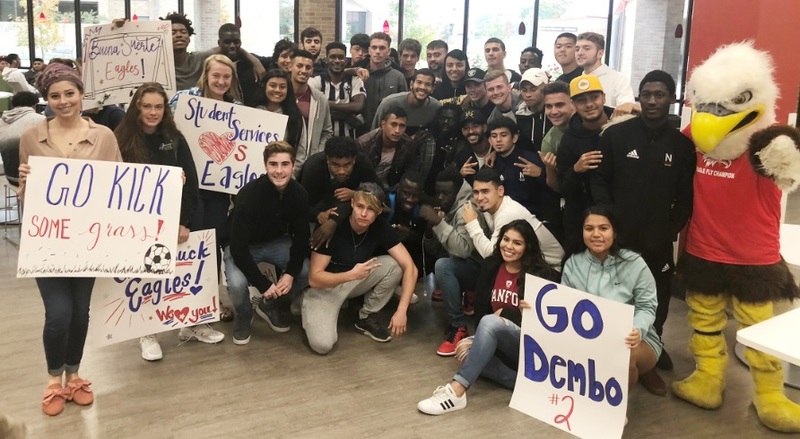 The Northeast Texas Community College Eagles men’s soccer team ended their season Wednesday in a sudden-death heartbreaker against top-ranked Pima College in the NJCAA Men’s Division I National Tournament in Daytona, Florida. The Eagles lost 3-2 on a golden goal in overtime. “We are very proud of our men’s soccer team for an outstanding season. These guys have worked hard, and they represented NTCC well in Florida,” Andy Morgan, NTCC Athletic Director, said. Pima’s Hugo Kametani scored first at 10:34. Ronaldo Brown answered with an unassisted goal for NTCC 35:01 into the game to tie things up. Jacob Pacheco scored again for Pima at 48:02. Shortly after, NTCC evened things out again with a goal by Mandel Steward, assisted by Duhaney Williams. Regulation time ended with the game tied 2-2. Kametani again stepped up for Pima during first overtime and finished things with a golden goal. The loss eliminated NTCC from the tournament. NTCC started off the tournament strong with a 5-0 win against Muskegon College. Williams led the scoring in that game two unassisted goals for NTCC. Aitor Granero scored one goal and had one assist. Steward and Brown had one goal apiece. It was the second time the NTCC men have played in the national tournament. Representatives from Northeast Texas Community College and West Texas A&M are pictured formalizing a new nursing agreement. Pictured (seated) is Dr. Brad Johnson (left), WTAMU Vice President for Strategic Relations and Dr. Ron Clinton, NTCC President. Standing (from left) is Dr. Marietta Branson, WTAMU Associate Nursing Director, Dr. Kevin Rose, NTCC Vice President for Instruction and Tonya Taylor, NTCC Director of Nursing. 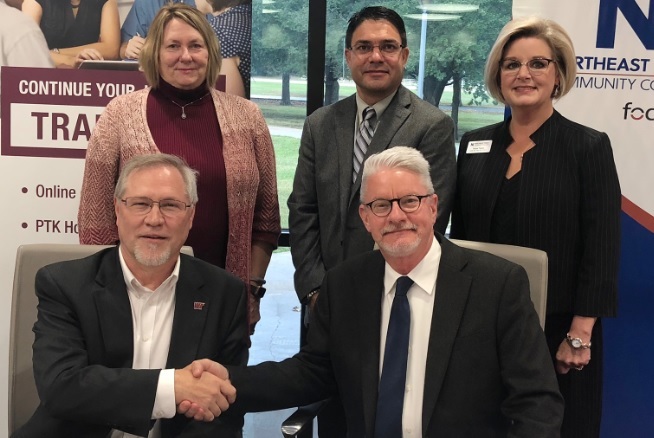 Northeast Texas Community College recently hosted representatives from West Texas A&M University (WTAMU) for an articulation agreement signing. The new agreement offers NTCC students who complete their Associate Degree in Nursing (ADN) and successfully obtain an RN license to seamlessly transfer to WTAMU’s Bachelor of Science in Nursing program. After becoming an RN, students would complete an additional 32 hours at NTCC and then move to WTAMU to finish the last 30 hours of bachelor-level nursing courses online. Among the representatives from WT was Dr. Brad Johnson, former NTCC president. He left NTCC in 2017 to take a position as Vice President for Strategic Relations. “It is such a pleasure to be back on the NTCC campus and see all accomplished since last year. While WT and NTCC are geographically distant, both are located in rural areas of Texas and share a similar mission in many ways. We are excited to be able to offer NTCC students another high-quality and affordable avenue for continuing their education,” Johnson said. To learn more about the nursing program at NTCC, visit www.ntcc.edu/nursing or call 903-434-8287. For more information about the BSN program at WTAMU, which has been named “most affordable in Texas,” visit www.wtamu.edu/nursing or call 806-651-2630. 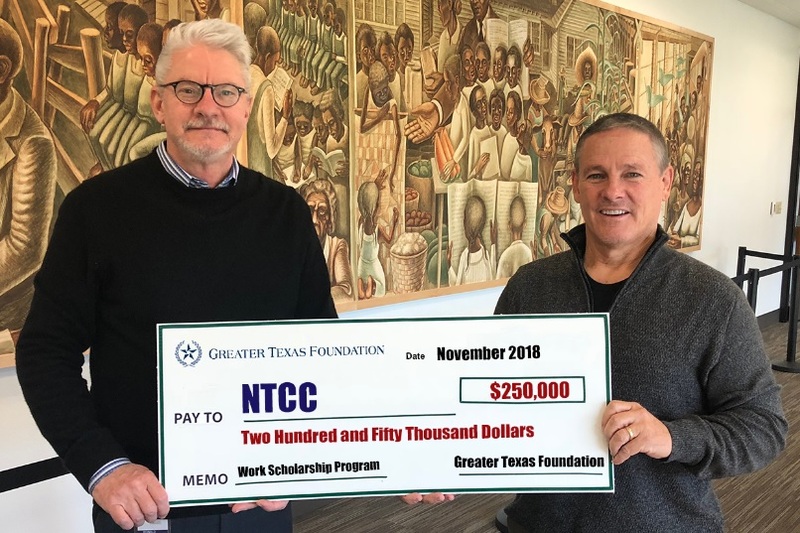 Northeast Texas Community College announced this week that it received a $250,000 grant from the Greater Texas Foundation to support the Work Scholarship Program. The grant specifies that $100,000 will be used to support Work Scholarship Program operating costs and the other $150,000 will contribute to the endowment to provide work scholarships well into the future. The money allotted to the funding will be doubled by a separate matching grant, adding up for a total impact of $400,000 to benefit the Work Scholarship Program. The NTCC Work Scholarship Program is a privately-funded initiative that allows students a chance to earn their NTCC education in advance by completing meaningful work on campus during the summer months. The program launched in 2014 with only 15 students. Just four years later, 63 students completed the program successfully. “We have received more and more applications each year as word has spread about this unique program. We are finding that there are many students out there who are willing to work hard to avoid going into debt to pay for college. The Work Scholarship Program gives them a structured, educational way to do so,” McCullough said. The Greater Texas Foundation supports efforts to ensure preparations for all Texas students, have access to, persist in, and complete postsecondary education. They put particular focus on helping underserved and disadvantaged populations. They pursue that mission by forming partnerships, supporting research, sharing knowledge, and making grants. To learn more about the Work Scholarship Program, contact McCullough at 903-434-8115 or visit www.ntcc.edu/workscholarship. Visit www.greatertexasfoundation.org to learn more about the work of the Greater Texas Foundation.